Bright-Eyes & Bushy-Tales: Starve a Cold? Yesterday was definitely a day where I had to pull out life's little handbook and recite to myself, "No matter how you feel, get up, dress up, and show up." I was feeling kinda icky, with a sore throat and just generally pretty clogged up. Narrrstie. Of course, life doesn't just stop when you're not feeling well. I had so much going on yesterday at school and errands to run since we were gone all weekend, so I had to put on my big girl pants and get going. I knew accomplishing some things yesterday, while taking it somewhat easy, would make me feel 10 times better. So, it's quiz time. Which one is not like the other?! Ding ding ding!! You guessed it -- the sweaty workout. I had signed myself up for a Monday Barre Burn class last week anticipating needing to sweat out all of the pizza, fried food, and sugary concoctions from the weekend at IU. I was SO looking forward to going last night, but since I wasn't exactly feeling stellar, I was a little hesitant. I'm never quite sure if working out while I'm not feeling well is smart. I know I should let my body rest, but when it's just cold-like symptoms, I also feel like I am capable of getting in a little sweat and not veering completely off the path of my exercise routine. I went back and forth in my head a little yesterday about it because I really can't afford to get any worse right now with finals and big things at work going on. I found an interesting article in the New York Times that basically said that working out with a cold (not with a fever or muscle aches!) has not exactly been found to be a bad idea. One doctor said he, himself, works out with a cold, just scaling back a bit, because he feels like it actually helps him recover faster. The article said that, in summary, people kind of make up their own rules for exercising with a cold. I like to dance to the beat of my own drum. So, I rolled with this idea and made up my own rules for last night's workout. I know at Barre Bee Fit they always offer modifications for the exercises depending on the level of burn you are feeling up to each day. I decided to go with a "light to medium" intensity yesterday, so when the instructor threw out options, I did the easiest or next-to-easiest version. Since I was taking the "hot" class yesterday, I took about a ba-gillion water breaks to stay hydrated. I also positioned myself closest to the door and farthest away from the fire-breathing-dragon machine that heats the room, to make it a little easier on myself. I think Jillian (she was teaching the class) was reading my mind yesterday because she threw out tons of words of encouragement and kept saying things like "whatever you can do today" and "listen to your body." This made me feel confident & comfortable that I could go at my own pace. Just kidding! ;) I'm really not that cool...they just came up with these and are handing them out to everyone who attends (I think!) now. 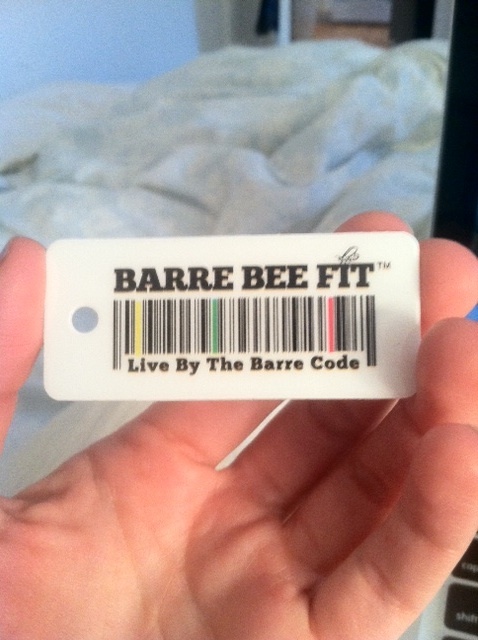 I was super-dorky-excited about getting my own BBF key tag though, it is just so cute with that little bee!! Being the cheese-ster I am, I made a mini joke, "So...which side do you scan?!?!" So the verdict is in and I am actually feeling (knock on wood) a whole heck of a lot better today after a light(ish) workout and a good night's sleep. I guess you really don't necessarily have to starve your cold of exercise. I'm off to have my daily oats and fuel up for another packed day -- a little teacher/student conference, work-age, and then maybe a little j.o.g. before dinner. Something to talk about: What are your "rules" when it comes to exercising when you're sick? Hope you guys all have a happy & healthy day! That's what we're aiming for up in here. I typically do workout when I'm sick...it always makes me feel better but it's also important to listen to your body. If you're feeling like absolute crap, don't push yourself.